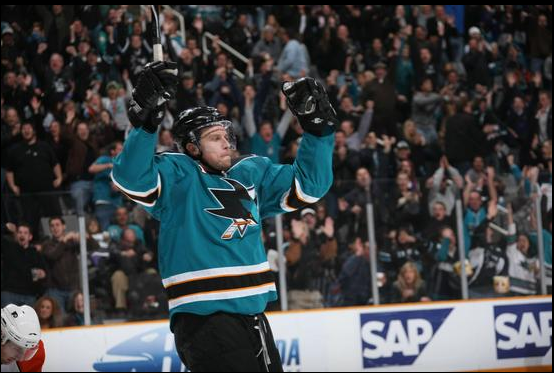 Quite the explosive performance for the Sharks tonight as San Jose defeated the Columbus Blue Jackets, 6-3. 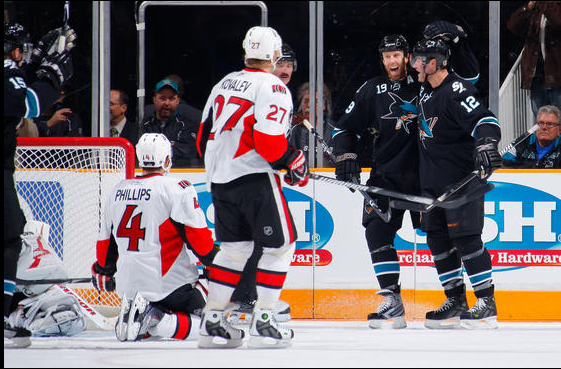 Dany Heatley had a hat trick in the home opener for the Sharks, making all the fans ecstatic. It is so nice to have a pure sniper on the team now. Sure, we had Jonathan Cheechoo and we still have Devin Setoguchi, but I always saw those players as needing a Joe Thornton. Heatley doesn’t need anyone but himself to score goals, and that’s what kind of player the Sharks have needed. Heatley had 3 goals, 1 assist, finished +5 and had 2 PIMs — a good night for Heater, to say the least. Heater’s first goal came on a hard-fought shift behind the goal line, then he scored on a wraparound. His next goal came from a Dan Boyle pass from the defensive zone all the way to the Jackets’ blue line. Heatley wristed it by Steve Mason. For the hat trick, Heatley was tripped in front of the net that led to a penalty shot. He calmly deposited it 5-hole, and the fans made it rain with hats. Two fights tonight, both coming in the second period. First fight pitted Clowe vs. Michael Blunden. This was no contest. Clowe carried his emotion into his fists as he busted Blunden’s head wide open. Blunden bled profusely from his left temple. The second fight involved Shark Frazer McLaren and Jacket tough guy Derek Dorsett. McLaren got his arm stuck inside his jersey and struggled the first half of the fight. Dorsett capitailzed with a couple left hooks, but McLaren finally got free of his jersey and proceeded to pound the living daylights out of Dorsett. I’m sure if Dorsett has some chips, he can dip them in his head because his brain is a nice mushy salsa now. Two d-men got on the scoreboard tonight, goal-wise. Dan Boyle did his usual pinching, and shot a wicked wrister top-shelf past Mason. Boyle assisted twice as well. Marc-Edouard Vlasic was the culprit allowing the Jackets first goal — another weak-side positioning error. He made up for it with a slapshot from the point through traffic. Good to see him make up for that mistake. You can’t be perfect. It was Jason Demers’ worst night of the young season, against Columbus. His first passes out of the zone were being intercepted or blocked. His puck control was suspect — at one point, Rick Nash stole the puck in the Sharks’ defensive zone. I’m sure Jason will clean up those mistakes though. Brad Staubitz was suspended for one game due to making excessive physical contact on an icing play against the Los Angeles Kings. Jamie McGinn filled in for him. There wasn’t much to report for McGinn. He was fast as usual, but that’s it. Columbus goalie Steve Mason was pulled after the Sharks’ fifth goal. At the time, he had allowed five goals on 20 shots. Joe Thornton quietly picked up four assists — Joe being Joe. I feel as though I need to write something after the Sharks’ 4-3 loss to the Florida Panthers. Watching the game, a concern of mine just grew, and that would be our defense. The first report was mainly focused on the offense and how much they have improved. But with that improvement, the Sharks are forgetting what has made them successful the last 3 years — their defense. The defenseman are now playing so far into the offensive zone that they are forgetting their first responsibilities. This has led to so many breakaways, its making my head spin. Nabokov is definitely not the best goalie when it comes to facing breakaways and 2-on-1s. Nabby has let in 14 goals the last 3 times, when usually that number would be around 4 or 5. Scary. The Sharks had 50 shots on goal and still lost! This just shows that you can have 100 shots on goal and the other teams gets 4 or 5 breakaways and coverts, you will lose. I do give Vokoun credit, he played well. I mentioned in the last post that Clowe should be the Sharks’ version of Tomas Holmstrom. Well, he is doing that more often, but Cheechoo seems to be taking over that role. Every game, it looks like he is less scared of planting himself in front of the net, which is great to see. The D feeds the shots from the point and Cheechoo and Clowe get the garbage goals. They still count as 1. “Weak” or not. Alexei Semenov played awful last night. One play he slapped the puck back between his legs which went right to a Panther, and that led to a pass and goal. Douglas Murray needs to get healthy and get back there. Semenov doesn’t cut it. At least cut his ice time. Vlasic needs more. He is our best defensive defenseman. Hopefully, the Sharks can limit Tampa’s goals tonight to 2 or less, and show a better defensive mold than what they have put on the ice the last couple games.